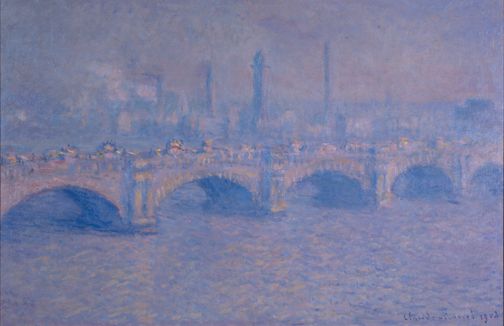 McMaster’s Claude Monet painting of Waterloo Bridge has been borrowed by the Art Gallery of Ontario (AGO) in Toronto for their spring exhibition Impressionism in the Age of Industry: Monet, Pissarro and more from February 16 to May 5, 2019. We are delighted that the work was selected and that we were able to accommodate the request. The painting has just returned from the nationally touring exhibition A Cultivating Journey: The Herman H. Levy Legacy, and following the Museum’s spring/summer closure, it will be hung once again at McMaster Museum of Art (MMA) in our autumn exhibition. MMA Collections Administrator Julie Bronson accompanied the painting to Toronto last week and shared some photos behind the scenes at the AGO. Behind the scenes placing Monet paintings, including McMaster’s, at the AGO. Impressionism in the Age of Industry: Monet, Pissarro and more is curated by Dr. Caroline Shields, AGO Assistant Curator, European Art. It explores how French Impressionist artists and their contemporaries, famous for their lush landscapes and sea vistas, were equally obsessed with capturing the spirit of the industrial age.“This exhibition invites us to journey through this period of immense change, experiencing its thrills and challenges alongside the artists,” writes Dr. Shields. Find out more about the AGO exhibition. And for those in the Hamilton area, the Carnegie Gallery in Dundas is organizing a bus trip to the AGO on March 2: Bus Tour Info.